Autism is my superpower! 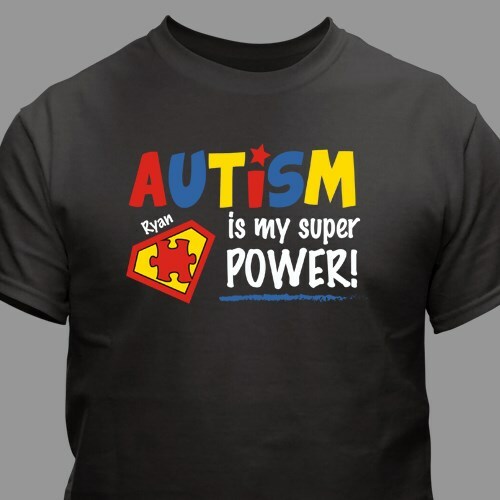 Show their superpower and awareness when you outfit your boy or girl in this superpower t-shirt. This love, hope and inspirational design may also be personalized with any name. Our shirts are 100% cotton, machine washable t-shirts. They come in youth sizes XS-L. Autism awareness clothing like this is a great way to let someone know that they should not hide from their Autism. I thought this was just the cutest thing when I seen it. My nephew has really come along way thanks to his school & I thought this shirt would let him know that he doesn't have to feel like something was wrong with him because of having autism. Again thank you. Not a fan of the charcoal gray, I should've gone with black. But everyone complimented the shirt at the autism walk & when I posted a photo of my son wearing it online.